Do you have furniture cracks, grooved floorings, and dented window frames at home? You know fixing these things require time, effort, and a few bucks from your pocket. 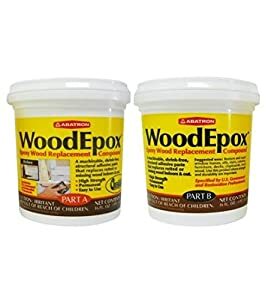 Good thing there’s the stainable wood filler to give you a budget-wise solution. If you don’t have any idea on how to choose the best wood filler, then you’ve come to the right place. Here, we’re going to show you how to choose the right filler and the important things you need to look for this product. 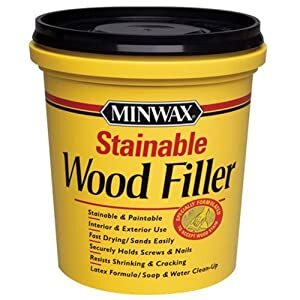 Likewise, to save you some time, we also included an in-depth review for the top 10 best stainable wood filler for 2019. Below are some of the important things you need to know and look for when choosing the best wood filler. Fillers for indoor applications don’t require solvents and free from any strong odor. They’re more friendly and safe for people inside your home. Likewise, it doesn’t need to be waterproof unlike the ones used outside the house. In contrast, fillers for external applications must be stronger and resistant to the outside environment. They have strong binding action and waterproof abilities to withstand environmental changes. Typically have a strong odor due to its solvent. All products have different drying time. Typically, fillers dry around 10-15 minutes. You can also read the product label to know how long it takes to dry. To help save the environment, you can choose fillers that contain environment-friendly ingredients and don’t use solvents with strong odors. It’s always the clean up after usage which adds the burden for the user. Most water-based fillers are easy to clean with a soap-water solution. In contrast, nonwater-based types require a specific solvent in order to remove excess coatings on the surface. This really works well in filling deadbolt boreholes, cracks, gaps, and reinforce screw holes. It dries quickly and you can sander or drill it after drying. If you want to paint it, better use a primer first before painting. The color is like pine with some dark granules. 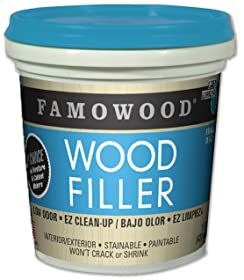 This perfectly fills rotten wood parts and don’t resist stain. You can place some screws on the part to be filled to give extra anchor for the filler. No worries, the screw heads will be covered by the filler. After applying the filler, it hardens around 3-5 minutes. Apply light sanding to smoothen surfaces. Sanded fillers take stain better than unsanded ones. You can use the Minwax Dark Walnut 2716 stain. 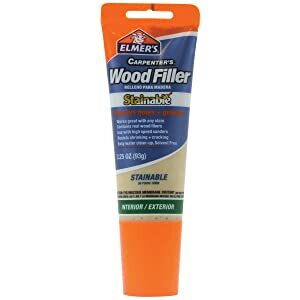 This is a good choice to fill scratches, gouges, and holes in your wood surfaces. It has a natural drying action with a color change to indicate it’s ready to be sanded, stained or painted. Initial color is vibrant purple then changes when drying naturally until it becomes pink or matte white. This is intended for indoor use, toxic-free, and solvent-free. It goes onto any gaps or cracks and sticks nicely and dries fast. A little sanding gives a near-perfect patch look. You can paint it over when dried if you like. Put a drop of water in the lid before closing it to prevent any clog up. The filler looks lighter upon application but gets darker after drying. A little sanding and some polyurethane as topcoat get the job done. This is an epoxy stick which requires the correct ratio. You need to cut a portion to be used with a knife and use it within 5-10 minutes or else it hardens. Allow 1 hour curing time before sanding or applying any stress on the applied portion. It's really good for basic repairs for the bond is strong after the curing period. Easy to use and solvent-free. This filler is easy to use, dries in 15 minutes and can be smooth or rough finished. You can do rough finish with taping knife before sanding to avoid clog-ups. It has a very good color match with red oak strip flooring. There’s a slight odor but not harmful nor disturbing. 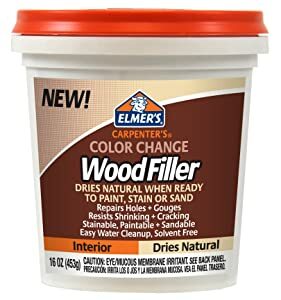 It’s a good filler for nail holes, dents, gaps, and rotted wood parts. 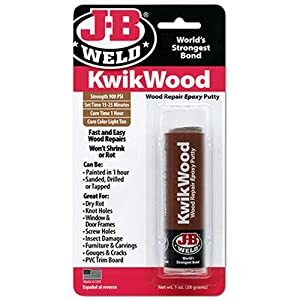 If you usually use adhesives and epoxy fillers, this stuff is a good choice to have. First, mix this product with resin/hardener until you have reached desired thickness. After, do the regular application process when using epoxy in filling holes, bonding surfaces, and filling gaps or cracks. Remember not to overfill the area to be applied as this will be difficult for sanding later on. This filler is solvent-based that uses acetone or lacquer thinner solvents. You need to slowly add solvent until you get the right viscosity for the application. It’s both suitable for indoor and outdoor applications. It can withstand temperature and humidity fluctuations and other outside changes. 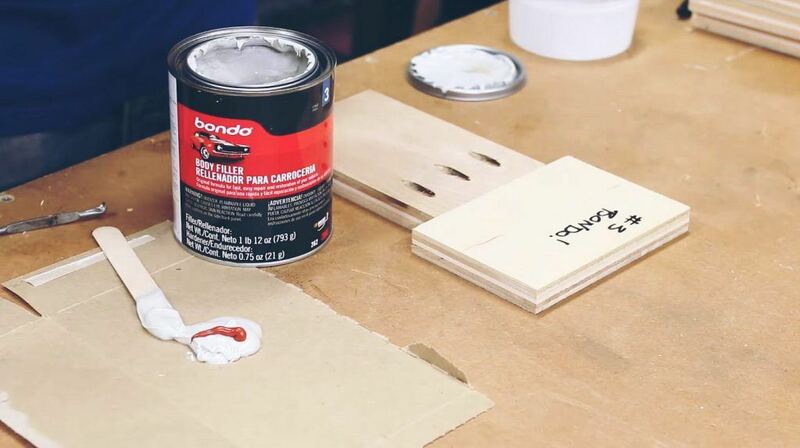 You can also apply water or oil-based paints for the hardened surface. This product is an epoxy-based solid system where the mixing ratio for the 2 parts is 1:1 by volume. It’s a white powder but dark brown and light pine wood-epoxy are also available. You need to mix the 2 parts at 1:1 ratio and it forms a wet sand consistency which you can mold in various shapes. It sticks very well to any wood surfaces. 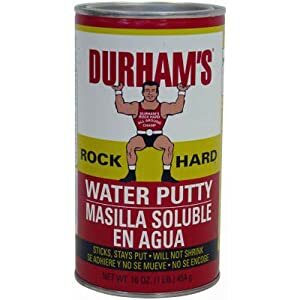 Apply like a regular putty and let it cure. You can sand it after curing to get a smoother look. 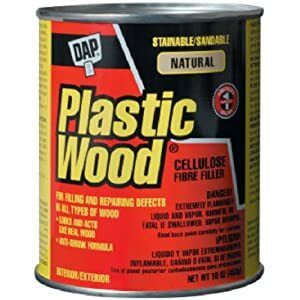 This filler works the same way as the Bondo plastic filler in repairing autobody. It comes with a red hardener when mixed with the beige Bondo, it turns to salmon color. The curing time is dependent on the amount of hardener mixed. Apply a small amount of hardener to have more time mixing and applying onto the surface. It’s really good for larger repairs and other stuff such as hiding countersunk lag bolts. This product is easy to prepare and the amount to be applied depends on the repair. A quarter inch thickness dries in less than one hour which can be sanded directly. There’s very little shrinkage so better do multiple applications when dealing with deep cracks.